We all know Henry VIII as the King of England who had six wives. It was certainly not his biggest triumph as King, for it is not really an accomplishment. But still, if you ask about him, that’s what people remember. But the man we now know as some sort of “serial husband” wasn’t always like that. Henry was happily married – or so it seemed, at least – to Katherine of Aragon, his first wife, for at least sixteen years. But around 1525, Anne Boleyn stormed into their lives and changed everything –for everyone. 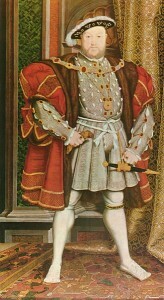 It has been said that Henry had considered annulling his marriage to Katherine as early as 1514, after five years of tenure during which she had miscarried a daughter and a son, and the royal couple’s son; Henry, Duke of Cornwall, had died within two months of his birth. Still, the annulment conversations came to a stop and Henry continued to be a loving husband until he met a young, flirty and feisty young woman who had the guts to do what no one ever did to a King. After Anne rejected Henry – a behavior completely unknown at the time -, Henry set out after one thing and one thing only: he wanted to make Anne Boleyn, the goggle-eyed whore, the scandal of Christendom; his wife and Queen of England. marriage to have a crown over that infamously dark hair of hers. Same way, we still don’t know if he was really in love, or if was just lust over the one woman who had ever denied anything to him. But the truth is, we will never know for sure. Those of us who are romantics at heart prefer to believe it was a love story gone wrong, while the skeptical say that it was only Henry’s lust and Anne’s ambition what brought them together. But no one can deny one thing: even after Henry grew to hate Anne, even after she had to plead him to remain a Queen, Henry was never the same after Anne Boleyn came and went out of his life. She undoubtedly left a mark, a mark which is clearly visible when we examine the King’s later years and his subsequent behavior towards his following wives. Henry definitely had high expectations on the women he married. He sacrificed a lot to get Anne – his faith, his church, the peace of his realm – and he expected Anne to fulfill her duty after their marriage. They must have been the happiest couple on Earth that January 25th, when they secretly got married. A few months later, she was even crowned – quite a feat for a consort – with all the honors a King would’ve received. Everything pointed to the power she held, second only to Henry at that time. miscarried two other babies, her future – and her daughter’s – started crumbling right before her eyes. Besides, she had also been politically active, and so had a greater number of enemies than any other Queen consort has ever known.And so, Anne Boleyn was beheaded on May 19, 1536. Henry was quick to move on and married Jane Seymour less than two weeks after that. But none of his marriages ever compared to Katherine’s in length. One could say that it was, partly, Anne’s own fault. Before her, Henry probably thought that going through an annulment, and all the events that lead up to it, simply weren’t worth it. But Anne made him realize he had more power that even he knew, and that he could easily get rid of anyone who displeased him. After Anne, Jane Seymour had to behave like a perfect, quiet wife to get the King’s attention and love. The one time she dared to speak up to him – pleading for the leaders of the Pilgrimage of Grace -, he quickly put her back into her place, remembering her of what happened to her predecessor. Anne of Cleves came next, and he immediately disliked her. For whatever reason it was, he had no problems to be rid of her, and she was smart enough to give him the annulment she wanted. When Catherine Howard betrayed the King, and that betrayal became known, she must have known she could no longer be Queen. But she hadn’t only cheated on him; she had made him look like a fool in front of his court, and she was beheaded, just like her cousin before her. Only Katherine Parr survived him as a Queen, but she also came close to suffering the Howards’ bloody end. And for what? A mere exchange of words where she expressed her religious views. It is obvious that after Henry met Anne, he came to the realization that he could, indeed, have whatever wife pleased him, and keep her only during the time he was happy with her. Sadly, although it was not all her fault, and such an amazing woman did not deserve the end she got; I believe she helped create the monster Good King Hal became later in life. She inspired him to do great things, but also created a lot of trouble for herself in the process. Still, half a millennium after her time, we remember her as a courageous woman who did everything she could to secure her daughter’s status. And I’m sure that if she had been given another chance, it would’ve been for Elizabeth sake that she wouldn’t have changed a single thing about her education, her life, her personality and ultimately, her untimely death. And she would’ve no reason to, because after so long, she became an inspiration for many of us, who see a little bit of us in that courageous, witty, intelligent young woman who Henry thought he could erase from history with the blow of a French sword. He couldn’t have been more wrong. Lovely article, that epilogue of yours is really moving! !